The Matawhaorua canoe brought Kupe back to Hawaiki from the Hokianga Harbour. 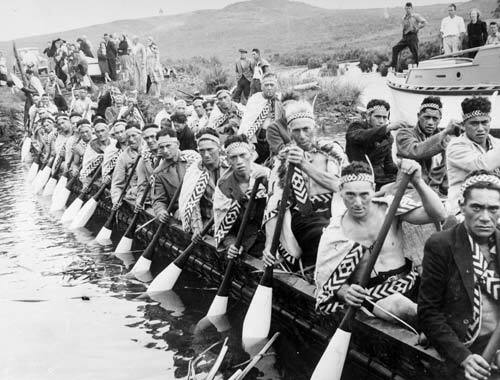 The canoe was re-adzed and renamed Ngātokimatawhaorua before Nukutawhiti captained it on another voyage to New Zealand. For the celebrations marking the centenary of the Treaty of Waitangi in 1940, a replica canoe was built. Here we see it being launched. I am a descendant of kupe and nukutawhiti i am from otaua where puhanga tohora resdes and remember another story that nukutawhiti captained the mamari waka with his brother inlaw ruanui. I really love this website though, tihei wa mauri ora!